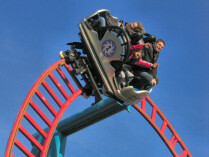 As the kids get ready to break up for half-term, Alton Towers are opening their doors for a two-week pre-season event. The Half-Term Hullabaloo event, which starts this Saturday, will allow those feeling the closed season blues to get some goes in on some of the park's roller coasters, as well as other rides. Update - 16th February: due to the popularity of the event, Hex has now been added to the ride line-up. Entry pre-booked costs £13 for adults and £7 for children (on-the-day prices are £15 and £10 respectively). The hotels also have an offer running during the event, where 4 guests can stay 2 nights at the resort for £69pp (park & waterpark tickets included). Look out for celebrities, they are always visiting, those bloody perverts.